Lock in a great price for Pullman Sydney Hyde Park – rated 8.4 by recent guests! Nice area & not too busy. Walking distance to center. I liked the spaciousness of the room, the bathroom and amenities, the cleanliness of the room and the comfortable mattress. The property is in a great location. It has all the amenities that one would need. The most comfortable beds I think I have slept on in a hotel. Staff made the experience all the more pleasant. Nothing was too much trouble. We had a great experience. The staff were fantastic and bent over backward to meet our needs. Very convenient. Comfortable. Easy to travel from the airport. The staff were absolutely fabulous, quick to accommodate all our needs and assist with anything we asked. Breakfast was also beautiful, perfect for Mother's Day for which we were there. Bed was amazing. Staff were amazing. Pool and spa has the best views. Room was beautiful. Location ideal. The bed was super comfy and the pillows were amazing. 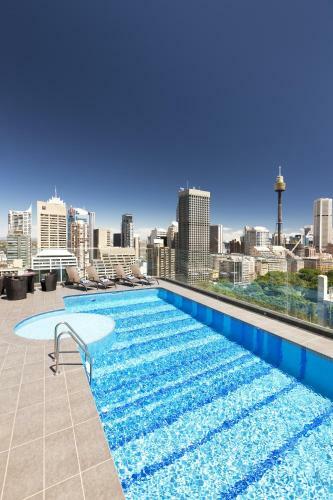 Pullman Sydney Hyde Park This rating is a reflection of how the property compares to the industry standard when it comes to price, facilities and services available. It's based on a self-evaluation by the property. Use this rating to help choose your stay! 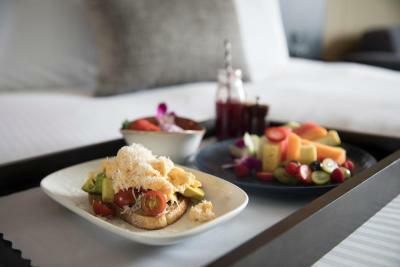 One of our top picks in Sydney.Located on Hyde Park in the Sydney CBD (Central Business District), Pullman Sydney Hyde Park features 2 restaurants and a rooftop pool and patio. 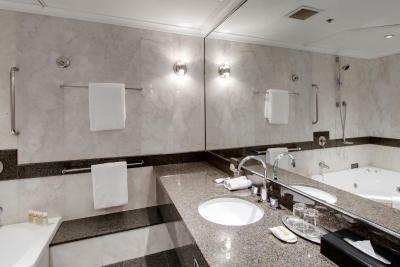 All guest rooms offer views of the park or city and feature an LCD TV with cable channels. 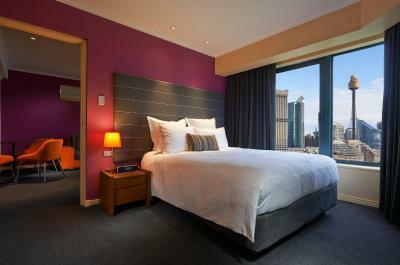 Pullman Sydney's spacious guestrooms each include a desk, seating area and internet access. Guests can work out in the fitness center or visit the rooftop recreation deck for a spa and sauna. 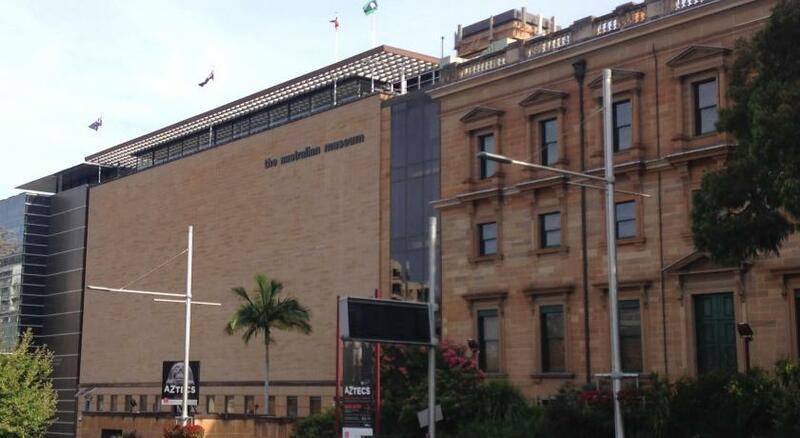 Pullman Hyde Park is just 2,950 feet from Pitt Street Mall and 5 minutes' walk from Oxford Street's shopping and nightlife. Darling Harbor is a 15-minute walk away. 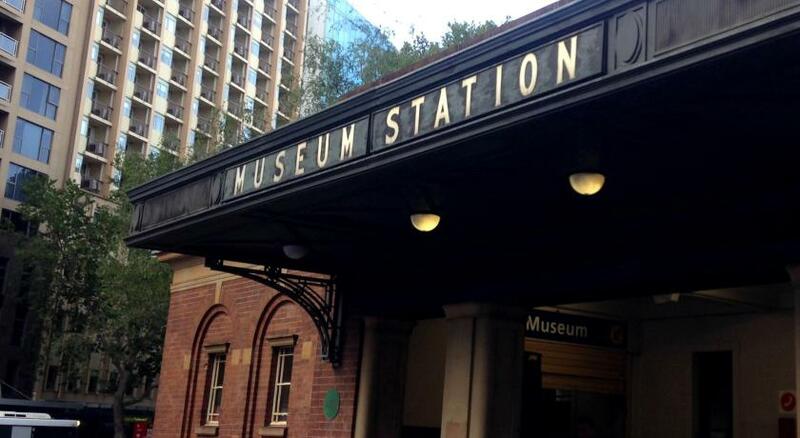 It is a 20-minute bus ride to Bondi Beach, there is a bus stop directly outside the hotel. 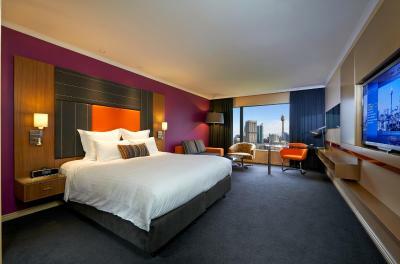 When would you like to stay at Pullman Sydney Hyde Park? Offering views of East Sydney, this room features an LCD TV with cable channels, tea/coffee making facilities, a desk and a spacious lounge area. 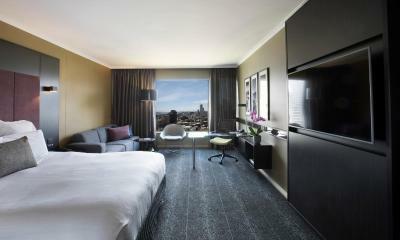 Room offers views of the picturesque Hyde Park. Features an LCD TV with cable channels, tea/coffee making facilities, a desk and a spacious lounge area. It also has 2 double beds. On the 20th or 21st floor, this room offers Hyde Park or bay views. - Free canapes from 6 pm until 7:30 pm daily. 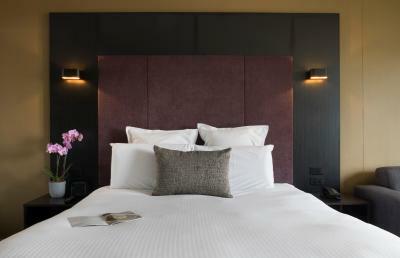 Room offers views of the picturesque Hyde Park. Features an LCD TV with cable channels, tea/coffee making facilities, a desk and a spacious lounge area. 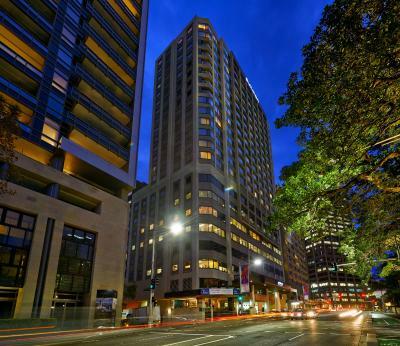 Spacious suite offers views of Hyde Park or Woolloomooloo Bay. Has a spacious lounge area with a flat-screen TV and a bathroom with a corner spa tub. With views of East Sydney, this room features an LCD TV with cable channels, tea/coffee-making facilities, a desk and a spacious lounge area. This triple room has a seating area, air conditioning and mini-bar. Third person will be accommodated in a rollaway bed. This triple room has a seating area, bathrobe and mini-bar. Third person will be accommodated in a rollaway bed. This triple room has a iPod dock, tea/coffee maker and mini-bar. Third person will be accommodated in a rollaway bed. 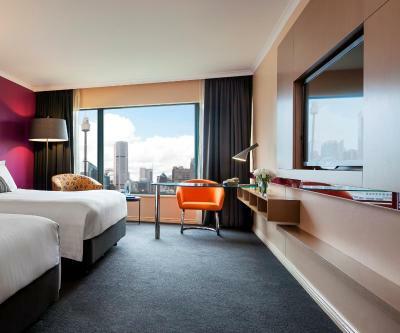 The 5-star Pullman Sydney Hyde Park hotel is directly opposite Hyde Park and bang in the city centre, so you won't have far to go if your interest tends to theatres, museums, shopping or bar-hopping. House Rules Pullman Sydney Hyde Park takes special requests – add in the next step! One child under 6 years is charged AUD 70 per night when using existing beds. All children under 16 years are charged AUD 70 per night for extra beds. 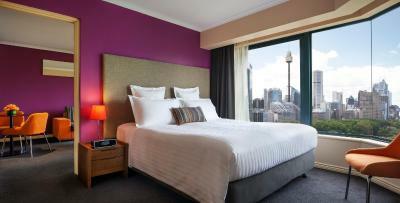 Pullman Sydney Hyde Park accepts these cards and reserves the right to temporarily hold an amount prior to arrival. Elevator was broken, room service was poor- was given incorrect/missing items that was on menu and the staff seemed annoyed to go back and fix the order. Have stayed before. Always find the facilities in good condition and breakfast value for money. The lifts not working was quite frustrating, we were waiting a really long time at some points. When I spend that kind of money I have less tolerance for that kind of experience. Nice big room, comfortable bed. All 3 lifts were faulty during the stay! Nothing really everything was nicely done though the Wifi should be for free to guest since they have paid to stay already. 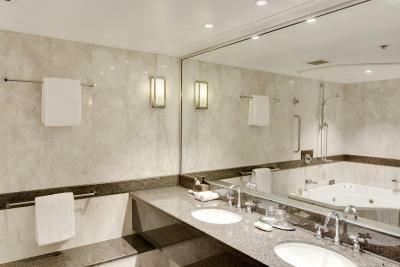 The room was large, bathroom was clean and modern.